NEWTON, Mass.--(BUSINESS WIRE)-- PerkinElmer, Inc., a global leader focused on improving the health and safety of people and the environment, is introducing the newest version of Lead Discovery for the TIBCO Spotfire® software platform at the Company's Revolutionaries for Global Health Summit. 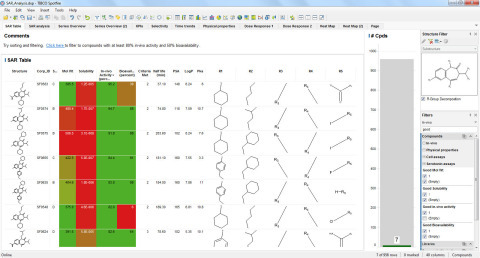 The new functionality of Lead Discovery 5.1 combined with the TIBCO Spotfire® software's advanced data visualization and analysis capabilities bring a new level of chemical intelligence to the informatics platform for advanced scientific discovery. PerkinElmer leverages its deep scientific knowledge and expertise in the development of the most comprehensive suite of scientific informatics and software solutions - from instrument generated data, to enterprise solutions to mobile applications. Built by scientists for scientists, PerkinElmer's integrated business-wide information management system provides companies and academic institutions with the necessary tools to aggregate, search, mine, analyze and visualize critical data so that they can turn data into actionable insights in an automated, predictive and scalable way. For more information, visit www.perkinelmer.com/informatics. The article PerkinElmer Introduces New Chemical Intelligence Capabilities for Accelerating the Lead Discovery Process originally appeared on Fool.com.